Yep I certainly do, the only reason I play tournament Hammer is to meet new people and compete against them....if I want something story based, epic (20,000 points+) and relaxed I'd stay at home in my garage and play Hammer. Having Icons gives you a goal orientated focus to tournament playing. I don't want to say that it's the best thing about Warhammer (it's not)but it certainly is a very different way of playing a game that I love, and it's fun. Isn't this ranking like anything Skaven related? Cheap, toxic, prone to breakdown and ripped from someone with better design skills. 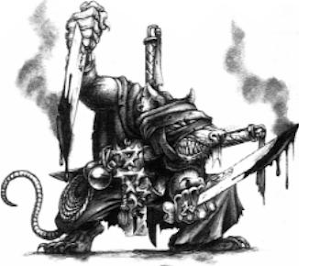 Skaven, the Chinese manufacturers of the Warhammer world. I guess mixing melamine into baby formula to cut costs would be a typical Skaven thing to do, and a fairly mild one at that. OT, good luck to you all this weekend, I hope you have a bal. Icon's add to the fun :) But if I get one its accidental, the pressure of this ETC year is just too pressurizing! And like a Gutter Runner in the night, Dan steals the icon! The precioussss.... I lied, they don't just add to the fun, they are life itself!